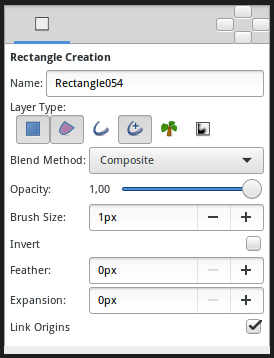 The "Rectangle Tool" is a tool who creates Rectangle Layer and easy creation of splined rectangles. Click where you want any corner of the rectangle to be, and drag to the opposite corner. The "Rectangle Tool" can also be used to create Outline Layer, Advanced Outline Layer, Region Layer, Plant Layer and Curve Gradient Layer . Click on the Canvas where you want to have corner of the rectangle to be, drag to the opposite corner, and release the mouse button when you are done.